I was afraid when we posted this that someone would think that it was a comment on the BlackLivesMatter protests, but Min thought i was crazy. It wasn't our intent. We were just having fun with our Wookies. We actually support #BLM and i don't really agree with Maher, even though we're Bernie supporters. I think ultimately Bernie and #BLM can and should be allies. And if you look at Sanders' actions after the disruptions - hiring Symone Sanders (no relation) to be his national press secretary, formalizing his positions on racial justice, and more, he's been showing his alignment with them. In return, the arm of #BLM that is aiming for specific policy goals - Campaign Zero - shows that Bernie is already more aligned with them than any other candidate. So i think their protests were effective and productive and i don't take them as an attack on Sanders specifically. They've really been protesting the political process itself. Sanders is actually their most obvious ally, so getting them to formalize his positions on their issues is only to the benefit to both. And all this on a post about Wookies! i said to him, "but it's Wookiees!". clearly fnord12 was right and i'm insensitive. mostly, i think maher is a douchebag. I don't think that anyone's disputing that Maher's positions on vaccines and the germ theory are irresponsible- he seems to be determined to bring back diseases that have been declining because of vaccines. But the BLM's disrupting of Bernie's speech WAS morally ambiguous- a protest that disrupts someone else's speech is infringing on THEIR right to speak. If it was some conservative group that did this to protest Bernie's socialism or whatever, I can guarantee you that liberals would be outraged. This is the kind of thing that depends on whose ox is being gored. I certainly agree with Black Lives Matter's overall stated goal, but I don't think Diversity of Tactics should be directed at potential allies, but rather clear adversaries. The supposed benefit was that the disruption of Sanders's speech drew attention to Black Lives Matter, but it is one thing to get media attention, it is another to shape your media image with a consistent message, and still another to transform that message into productive conversation, and then into action. If Campaign Zero had been made public the same day as the disruption, then Black Lives Matter would have successfully gained attention and shaped their message. And if they had allowed Samders to speak after the initial disruption, then they could have created an opportunity for productive conversation. That there is public debate over Black Lives Matter vs All Lives Matter tells me that BLM did not shape their message as much as they could have with that disruption. The attention might ultimately work to both BLM and Sanders's benefits, but I am concerned that the potential risk might exceed any gain made. If Sanders loses the Democratic nomination (or gains the nomination, but loses the election) and the actual winner does not enact/support reform of the criminal justice system (and with failure of enacting focused gun control laws after each mass shooting, enacting such change is not a given), then Sanders's loss might be viewed as being due in part to Black Lives Matter not supporting him, the single candidate who clearly shares most of their values and who clearly needs their support more than any other candidate. So it is possible that the Black Lves Matter movement ultimately runs the risk of being seen as being detrimental to their cause, much like Ralph Nader was perceived as costing Al Gore votes in 2000, which could weaken support for them or damage their credibility. I think that would be tragic for BLM and for the country, but recent Canadian politics shows the dangers of what happens in splitting the vote among potential allies rather than them decisively joining together, and certainly American political history is full of other examples of similar dangers (Bull Moose Party, for instance). And unfortunately, I don't think America can afford to have either a moderately affective or corrupt President for the next four years. We need a very effective, progressive President more than ever. And Fnord and Min, I thought the Wookies simply meant you were anti-Palpatine. I didn't even know about BLM incident at the time of writing of the Bill Maher comment. I just wrote it because Maher supports the messages in the wookie image. Sorry if I offended anyone. see, fnord12. 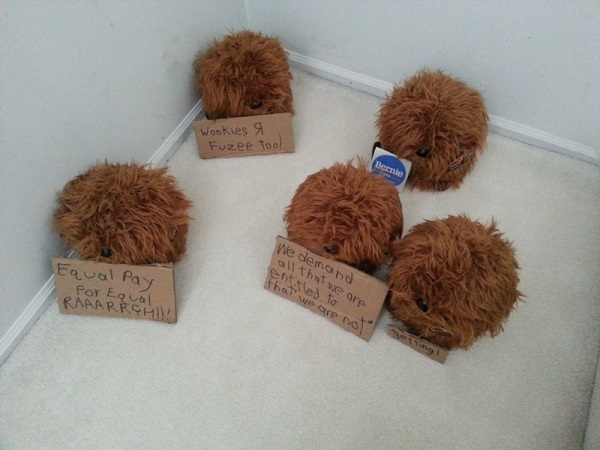 i told it was just Wookiees!